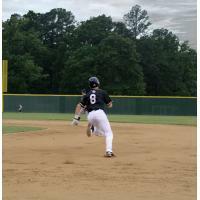 Texarkana, TX - The Texarkana Twins were back in action on their home turf to face the Victoria Generals for the first of a two-game series. The Twins came out ready to play and overcame a late inning deficit to then dominate the 9th inning to clinch the win and a spot in the playoffs. The Twins were the first to score in this pitching battle against the Generals. In the 3rd inning Coltyn Kessler started things off with a walk. Jaylon Keys stepped up to the plate and sent a shot to right center field earning a stand up double and bringing Kessler across the plate. The Generals quickly answered back in the 4th inning making the score even at 1. Victoria took the lead in the 5th giving them a 2-1 lead. The score remained the same until the top of the 8th when the Generals added one more making the score 3-1 heading into the 9th inning. With little time left to score the Twins bats came alive in the 9th. Leadoff batter, Tanner Sparks, started the inning off with a single. Hunter Church followed suit with an earned walk to put two men on. Gunner Halter hit the ball to 2nd base allowing the runners to advance. Coltyn Kessler hit a chopper to the short stop, who bobbled the ball, allowing Church and Sparks to score tying the game up at 3 a piece. With Kessler on base, Cam Hill smashed a two-run walk off homer to win the game 5-3! Starting pitcher Jack Christian went six complete innings giving up 2 runs. Relief pitcher Ryan Collins took the mound for two runs giving up one run. Jesus Gamez took over in the 9th inning giving up no hits and no runs allowing the Twins to close the gap late in the game. The Twins showed a lot of resilience throughout the game being behind for nearly the entire time. Timely hits paired with taking advantage of the Generals mistakes allowed the Twins to get the win. The Twins will wrap up this two-game home series tomorrow night at George Dobson Field. This will end the regular season for the Twins. The Twins have secured a spot in the 2018 playoffs for the second season in a row!